CHARLOTTE, N.C., Jan. 15, 2019 /PRNewswire/ -- Ally Financial, Bank of America and Barings, three of the leading financial services companies in Charlotte, announced a combined investment of $70.75 million for affordable housing in the city and surrounding area. This private investment marks the largest private-public initiative of its kind in Charlotte. 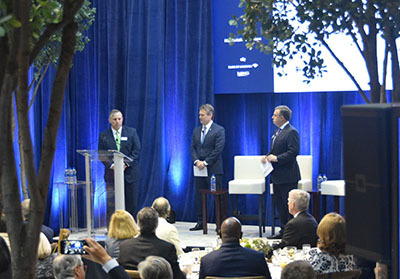 Ally CEO Jeff Brown, Bank of America CEO Brian Moynihan and Barings Chairman and CEO Tom Finke agreed to explore how each of their companies can help address some of the city's biggest challenges that relate to economic mobility. Together, the companies are making a combined investment to incentivize the creation of more affordable housing. The Charlotte area has witnessed explosive growth over the past two decades, driving housing costs up and creating a shortage of affordable homes for low- to moderate-income families. "I hope today's announcement encourages more companies to come forward to support our city," said Charlotte Mayor Vi Lyles. "It's going to take all of us to solve these big issues facing so many of our citizens." $50 million in below-market loans to finance affordable housing developments, which is equivalent to a $1 million grant per year for the next 15 years. $11 million invested in the newly proposed Housing Opportunity Investment Fund, which will assess affordable housing projects and find financing to execute viable projects. $2.5 million allocated to economic mobility programming and grants over the next five years. $7.25 million worth of land donated to make affordable housing possible, particularly in Uptown Charlotte. "In Charlotte, the general public, the business community and elected officials work together to take action and meet these needs," said Moynihan. "This is a great model for other cities addressing similar issues." The below-market loans, which represent the largest portion of the investment, will be priced as much as 2 percent below market rate, potentially saving affordable housing developers $1 million every year over the next 15 years. This will help families access more affordable housing options with more inventory available. "While this investment is significant, there is more work to be done to make affordable housing achievable and sustainable in Charlotte," said Finke, who made the investment in partnership with Barings' parent company Massachusetts Mutual Life Insurance Company (MassMutual). "We hope this partnership inspires other organizations to contribute to increasing economic mobility in our community." The newly-proposed Housing Opportunity Investment Fund will be managed by the city's Local Initiatives Support Corporation (LISC), which is part of a national corporation that focuses on projects that revitalize communities and bring greater economic opportunity to residents. "As the Charlotte economy has grown, low- to moderate-income families have to pay a disproportionate percentage of their take-home pay for decent housing in safe and stable neighborhoods," said Brown. "We are excited to be working hand in hand with Bank of America and Barings to make this contribution to affordable housing, and we're encouraging other companies to join us in this important initiative." Barings is a $310+ billion* global financial services firm dedicated to meeting the evolving investment and capital needs of our clients. We build lasting partnerships that leverage our distinctive expertise across traditional and alternative asset classes to deliver innovative solutions and exceptional service. Part of MassMutual, Barings maintains a strong global presence with over 1,900 professionals and offices in 16 countries. Learn more at www.barings.com.